(a) Check the lock function with the pulley installed in the vehicle. (1) Visually check that the rotor in the generator operates with the engine running. (b) Check the lock function with the pulley removed from the vehicle. 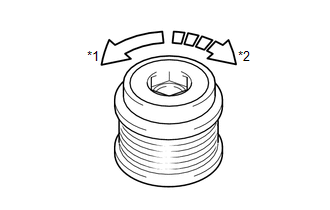 (1) Remove the generator pulley cap. (2) Hold the generator rotor using SST, and turn the clutch pulley clockwise to check that the outer ring locks (See page ). (a) Start the engine and visually check the clutch pulley for looseness. The clutch pulley is not loose.